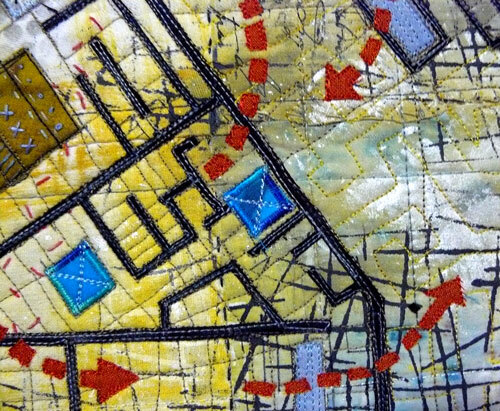 Art quilt map’ to fit in with this theme of ‘escape’. The building plan I have used is fictional and has no particular significance. My primary intention of this piece was not so much in interpreting the theme, but to present a visual buffet of shape, line, texture and colour. The collage process was quite an easy and enjoyable one. 1. Light coloured fabric were cut (or torn) and sewn onto a substrate (I used felt) with a contrasting thread. Some rough edges were left. 2. Chunky hand sewing was then added in a random way to give this background some extra texture. 3. 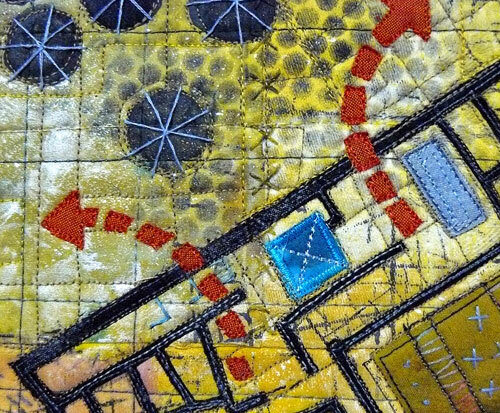 Fabric paint (in this case yellow and pearl white) was added sparingly with a brush to unify patchwork pieces together. I also added a thermofax stencil and sequin trash stencil later on. 4. A few sheer fabrics were then applied with misty fuse. I used tulle and pink silk organza. 5. 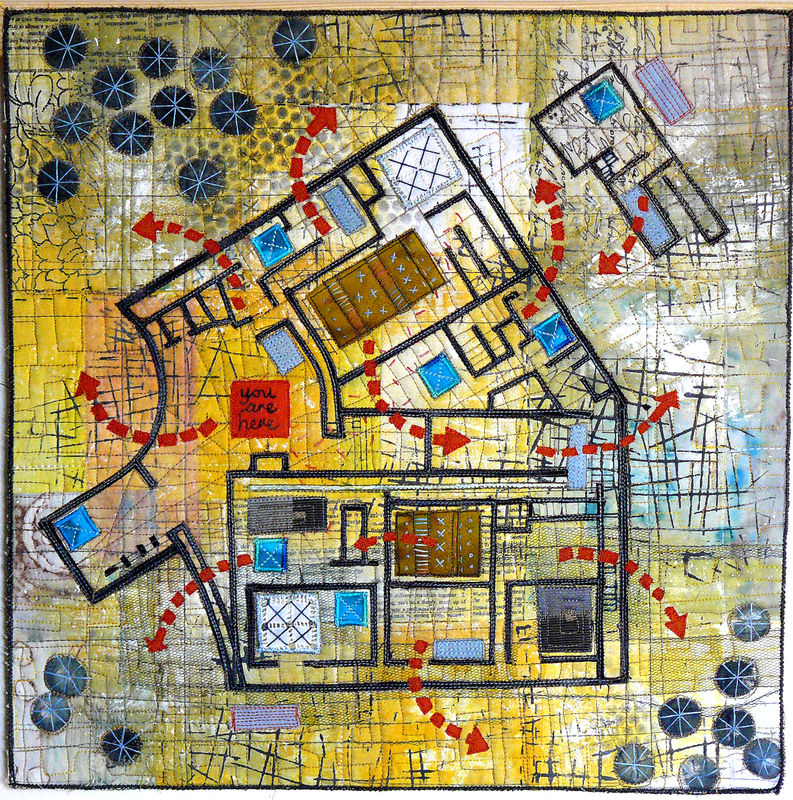 The linear and rectangular elements of the plan were then fused into place and thread painted. 6. The backing was added and the whole thing quilted. 7. More hand sewing, such as the stars on the trees, was added to give the final touch. I decided that a traditional binding would be too heavy for the piece. The work needed to have a thinner frame, so I decided to try a method by Terry Grant (of ‘The 12’s) of zigzagging over pearl cotton. I thought this worked well, although I found it a bit tricky to keep the couching straight. Perhaps there is a special foot you can use? I like the colours of grey, yellow and blue, but I’m not too sure about the orange arrows? Perhaps they would look better as a blue-red….perhaps I’m being too fussy! There were some design issues that has to be dealt with. The walls of the plan were very heavy. I tried to counterbalance this by offsetting them with the trees in the corners. I also try to ‘knock them back’ with thread and I completely painted over one of the inside walls! It was also difficult to get the arrows to look balanced. I added the “you are here” (against my husband’s advice) as a focal point. I enjoyed doing the hand stitching for a change and it really took no time at all. I think I would like to make another piece of a place that I identify with– something with paddocks, rivers and dirt roads. I also like the idea of adding your own poetry, like a Haiku. I would recommend this book/process for any of the Latitude girls to try, even if, like me, you think it is not your ‘thing’.